In honor of the Extraordinary Jubilee Year of Mercy (December 8, 2015 – November 20, 2016) the Children’s Rosary has released an audio version of the Chaplet of Divine Mercy. You will hear the sweet voices of two members of the Children’s Rosary: Anna age 8 and Emily age 6 leading the prayers. Both high and low resolution recordings are provided below. For those with dial-up internet connections the low resolution version is recommended. We invite you to pray along with the children. 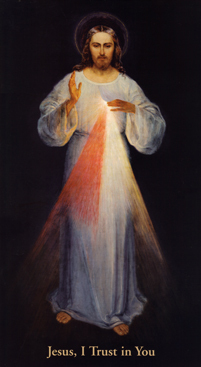 Image of Divine Mercy used with permission of the Marian Fathers of the Immaculate Conception of the Blessed Virgin Mary. Permission for the audio recording of the Chaplet of Divine Mercy granted by the Marian Fathers of the Immaculate Conception of the Blessed Virgin Mary. Background music performed by Gil Andrada.